The character of an olive oil depends on a number of critical factors: the olive variety and their maturity when harvested, how the olives are handled during harvest, and how quickly they are crushed. At The Olive Table’s family groves, the olives are handpicked and crushed within hours of being harvested. 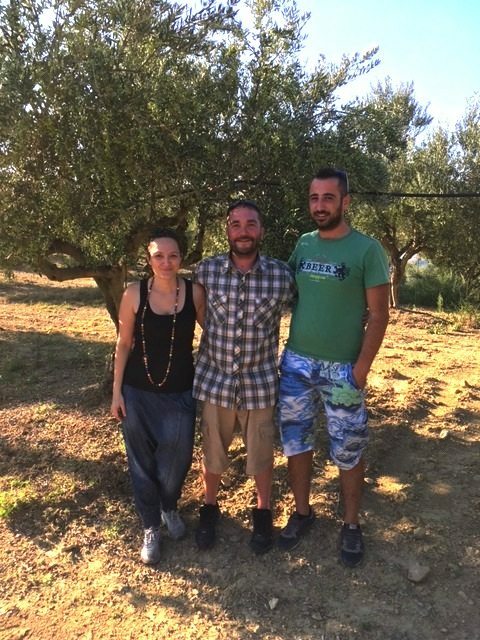 Our family understands the optimal time to harvest olives for both conventional and ‘early harvest’ oils in order to maximize their taste, aroma and health benefits. The Extra Virgin Olive Oils are produced in the southwestern part of Greece known as Messenia. Of the factors contributing to the production of outstanding oil, one of the most important decisions is the timing of the harvest. Olives can be harvested for oil at varying times during the ripening process. When olives are harvested early they generally yield less oil, and that oil has a deeper green color and a higher level of bitterness and pungency. This is because the olives contain a higher level of chlorophyll and therefore a higher poly-phenol count (up to five times that of olives picked during the regular harvest). Poly-phenols are the compounds that contribute to the bitterness and pungency of the olive oil and provide many of the health benefits. (Read more about olive oil’s health benefits under ‘Koroneiki Olives.’) In addition to the added health benefits, early harvest oils have a longer shelf life than ripe harvest oils because the antioxidant properties of the poly-phenols slow the onset of rancidity. Our Private Reserve Extra Virgin Olive Oil come from our family’s groves located in the coastal town of Kyprissia in Messenia, Greece. This is a fresh, lively mono-varietal pressed from Koroneiki olives. It is low in acidity (less than 0.3%) and has a fruity aroma with hints of fresh green herbs, a mild bitterness and a peppery finish. It is a subtle, balanced and harmonious oil best used to enhance delicate tasting cuisine, including fish, chicken, carpaccio, fruit, desserts, baking, and salads; or as a key ingredient in dressings, dips and marinades. Also try it on a toasted baguette with a sprinkle of dried oregano to create a simple and healthy snack! Our Organic Single Estate Extra Virgin Olive Oil comes from our cousin’s groves in the beautiful mountain village of Christianoupolis in Messenia and is also a mono-varietal pressed from Koroneiki olives. The olives are handpicked early in the season while still green to produce ‘early harvest’ oil, known in Greece as ‘agoureleo.’ Once harvested, the olives are crushed within hours to preserve the taste and aroma of the olives. The resulting oil has the aroma of green figs and fresh green herbs with hints of wild asparagus and flat leaf parsley and thyme. The taste is light, fresh and herbal with a slight chicory bitterness and mild peppery heat, following by a short nutty finish. This is a balanced and harmonious oil with acidity of less than 0.3%.